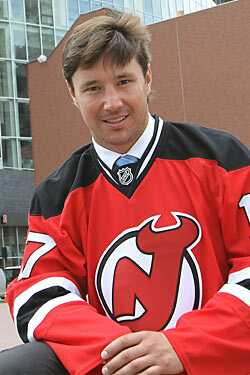 Remember that seventeen-year contract Ilya Kovalchuk agreed to the other day? The one the Devils held a press conference yesterday to announce? Well, the NHL has rejected it. A quick primer on why contracts like this exist: Under the collective bargaining agreement — a document they canceled an entire season to produce — a player's cap hit is determined by adding up the total value of the contract (including achieved bonuses), dividing it by duration of the contract, and adjusting, if necessary, for time spent on the NHL roster in a given season. Because the cap hit for a given year is determined by this average, and not by how much a player will actually earn, contracts for stars like Kovalchuk or Marian Hossa are front-loaded, and years are tacked on to the end at relatively low salaries to decrease the total average. From the player's standpoint, tacking on those years at the end doesn't really matter — especially in this case, where it obviously would have been the last contract Kovalchuk would ever sign. The player will likely retire before the low-salary years kick in, having already received the vast majority of the money. And the teams like it even more: The cap hit is kept relatively low — Kovalchuk would have cost $6 million against the cap — and once the player retires, the contract comes off the books, as long as the player is 34 years old or younger as of June 30 of the year in which the contract is signed. There's nothing in the CBA that explicitly prohibits contracts like this. In fact, we'd been wondering why the Devils would stop at seventeen years: Why not a 100-year contract, tacking on even more years that would never be paid out? (We even ran our question by Christian Delos Reyes, who runs the indispensible website nhlnumbers.com, and he told us nothing in the CBA would prohibit this.) If you're going to make a mockery of the CBA — and we in no way blame the Devils for doing so — why not make an even bigger mockery of it and save even more cap space? The NHL has expressed displeasure with these contracts before, and this time they put their foot down. Their basic argument is that the years are tacked on solely to reduce the average value — no kidding — thereby circumventing the rules. The AP's source says no party truly believes Kovalchuk will play out the full contract. The Players Association will likely challenge the league's rejection, so this isn't over yet. Worth noting: The current CBA can be up for renegotiation after this coming season, as it expires in September 2011 (though the union can extend it to September 2012).